On a night when Amanda Nunes staked her claim to being the greatest fighter in women’s MMA history, it should come as no surprise that she got a little something extra for her work. Hawaiian fighting legend-turned-Hawaiian slow-motion punching bag BJ Penn is a shadow of his former self, and one of the saddest cases of a fighter who should retire but won’t around. But the UFC is pairing him up against TUF winner Ryan Hall for UFC 232, and that is the greatest BJ Penn fight we can hope for. If you’ll recall, the greatness surrounding Penn began to crumble around when he first lost his lightweight belt to Frankie Edgar. He ended up losing to Edgar two more times, and in his last five fights, has remained win-less. …Which makes this Hall match-up so awesome. On a scale of one to ten, with ten being the best, Hall’s jiu-jitsu is a solid eleven. However, on a scale of one to ten, Hall’s striking is about a two – which means that maybe he’ll beat Penn, but he BEAT Penn into a sad pile of hamburger meat. When it comes to the UFC re-using these formerly retired fighters over and over again until they’re dead, this is the best possible match-up we could have hoped for. If Penn wins, it’ll be via his jiu-jitsu, and he’ll have defeated a recent TUF winner; if Hall wins, it’ll be via jiu-jitsu, and Penn will emerge from the cage without a scratch (or at least without a concussion). At this stage, what more can you ask for in a BJ Penn fight? A UFC Hall of Famer and MMA legend will return to the Octagon on December 29, as BJ Penn battles former Ultimate Fighter winner Ryan Hall in a UFC 232 bout at T-Mobile Arena in Las Vegas. Back in the Octagon for the first time since June 2017, Hawaii’s Penn storied career has seen him defeat the likes of Matt Hughes, Jens Pulver, Diego Sanchez, Kenny Florian, Matt Serra and Caol Uno en route to a pair of UFC titles at lightweight and welterweight. This December, “The Prodigy” will attempt to hand Hall his first UFC loss. A high level and decorated grappler, Hall will make his first UFC start in two years at UFC 232 as he hopes to add another win to a perfect Octagon record that has seen him defeat Artem Lobov and Gray Maynard. 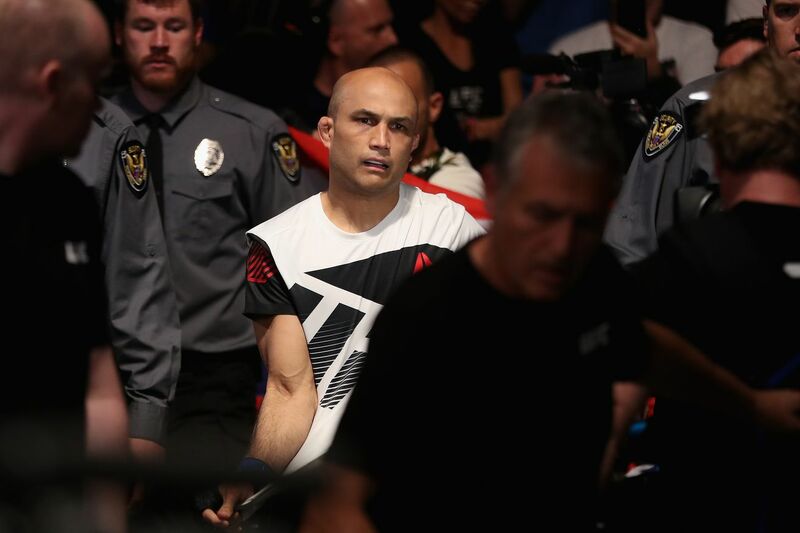 The post BJ Penn vs. Ryan Hall Is the Best BJ Penn Fight We Could Hope For appeared first on Caged Insider. Winless in his last six Octagon appearances, former two-division champion B.J. Penn will return to action against Ryan Hall at UFC 232. Penn Returns, Faces Hall At UFC 232! B.J. Penn promised he’d make an Ultimate Fighting Championship (UFC) return, and now we have an official date … and opponent. After rumors hit the Internet, the mixed martial arts (MMA) promotion confirmed earlier today (Weds., Sept. 12, 2018) that “The Prodigy” will face Ryan Hall at the year-end UFC 232 pay-per-view (PPV) event on Dec. 29, 2018, in Las Vegas, Nevada. Penn hasn’t competed since June 2017, losing to Dennis Siver via decision. The loss marked his fifth defeat in a row over the course of the last six years. Indeed, Penn has seen better days inside the Octagon, losing seven of his last nine outings, with his last win coming in 2010. It’s an unfathomable bleak streak from one of the best to ever compete in the sport. As for Hall, he has been out of action for two years now, but is riding a six-fight win streak, winning his only two fights inside the Octagon against Artem Lobov to win season 22 of The Ultimate Fighter (TUF), and then besting Gray Maynard in his following fight. While the pairing seems like a head scratcher at first glance, it will pit two of the best submission artists in the game, as Hall has numerous medals and accolades to his credit from Brazilian jiu-jitsu tournaments all over the world. Meanwhile, Penn’s jiu-jitsu is well-known and his background speaks for itself. While a win for either man won’t do much for their respective stocks, it will still draw plenty of eyes. The question remains: Is Hall someone the former Lightweight and Welterweight champion can beat?